Goblin films has become of interest to the media since the 2007 appearance of Managing Director Denise Channing on an episode of Dragon's Den. The interviews and articles have become too numerous to fully list on this page, but media interest continues and is about to see a new wave with the release of Graveyard Shift, our first completed project. April 2008, the trades pick up a story about the test shoot in Norfolk, UK. The shoot which actually occurred in November 2007 attracted the attention of a documentary crew with presenter Katherine Jakeways. 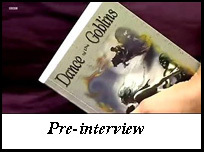 Done on almost no budget, it generated many images that could be used in publicity as well as valuable insights on things like goblin make-up and choice of weapon props. 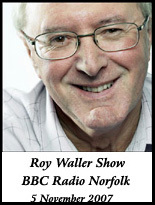 The day of the notorious Dragon's Den appearance, Denise Channing was interviewed by Roy Waller on BBC Radio Norfolk. Although the funding wasn't obtained from the reality game show, the attendant publicity and controversy on Internet sources created a publicity stir of its own. Denise was interviewed again on the morning show and ten minutes later by telephone by another station. More interviews followed both on radio and in the East Anglian newspapers. The interview before the programme tells more about the project than anything that made the edit on the actual episode did. But the publicity generated by the appearance brought public attention to the film as well as the book.